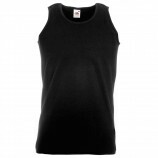 Best Workwer stock this great range of men's sleeveless t-shirts. These garments are ideal for sport wear, casual summer wear or as a garment to wear under tops as a vest. We have a small but quality collection here from SOL's, Fruit of the Loom and others ensuring that you receive a top quality product that is comfortable and lasts. Browse below and remember personalised embroidery and printing is available on request or during the checkout process.